Rare Sunnyslope Rambler with spectacular unobstructed VIEWs! This custom built craftsman home is like a needle in a haystack. 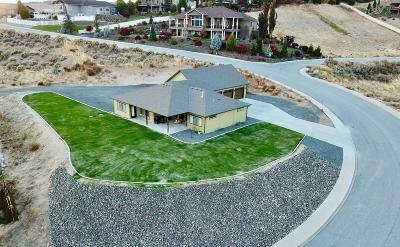 Level lot serviced by irrigation, no stairs going in or out of the home. Beautiful high quality finishes, and constructed for functionality and longevity. Features 4 bedrooms, 2.5 bathrooms, a home office, bonus room above the garage, HUGE walk in pantry, master suite with closet that walks into the laundry room. Oversized garage is a dream with 3 full stalls and 1,250 square feet of space. Gas fireplace and cooktop, pot filler. granite countertops and so much more. Must see it to believe it!